I tried the Spicy Patriot Wing Sauce Fidel Gastros' Matt Basile made for the #SabraTouchdownChallenge. We really like the flavour of the sauce when it is tossed with chicken. 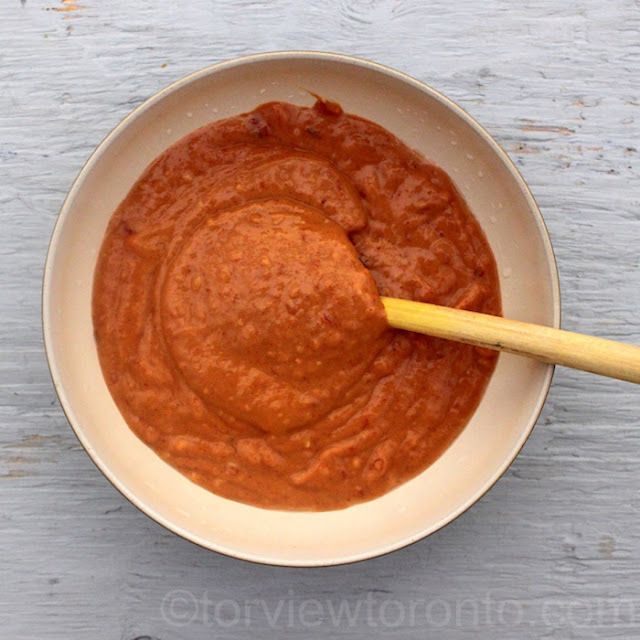 I like how easy it is to make this sauce. 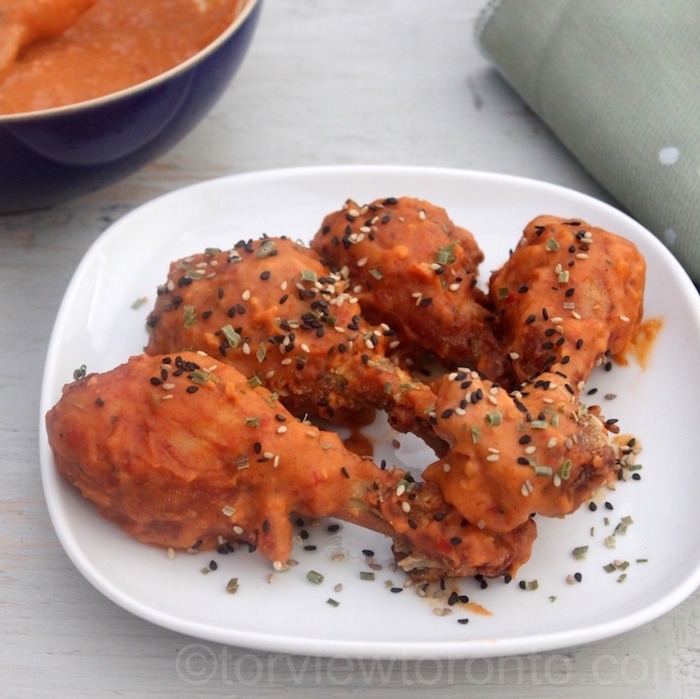 For the Spicy Wing Sauce recipe all you have to do is mix the ingredients together and toss the fried chicken wings or drumsticks and serve. We can adjust the ingredients according to our taste buds to make it either spicier or more sweet. 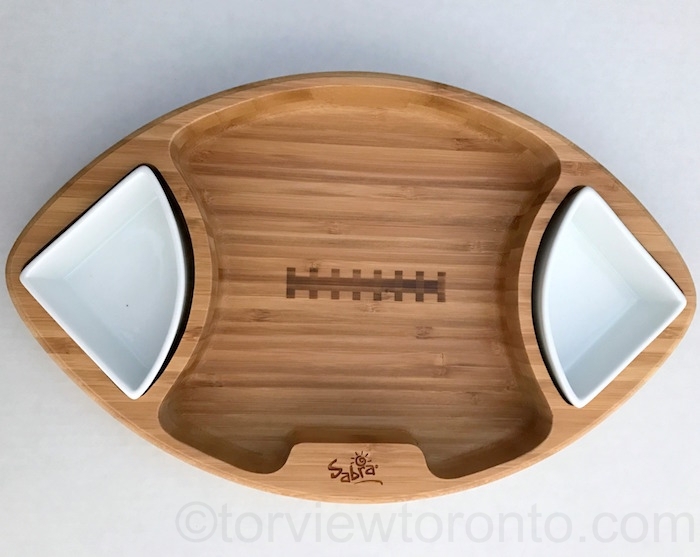 If you are in Canada and would like to win a Sabra football shaped bowl and 3 coupons to purchase any Sabra Canada products enter the giveaway through the rafflecopter below before February 24th. Please leave comments and follow my social media networks to be eligible to win. I live in Lawrencetown, NovaScotia . I love making homemade BBQ sauce for my chicken wings. I use a garlic sauce and sprinkle with grated parmesan. Q: "Where in Canada do you live? Do you have a favourite way of preparing the sauce for your chicken wings?" 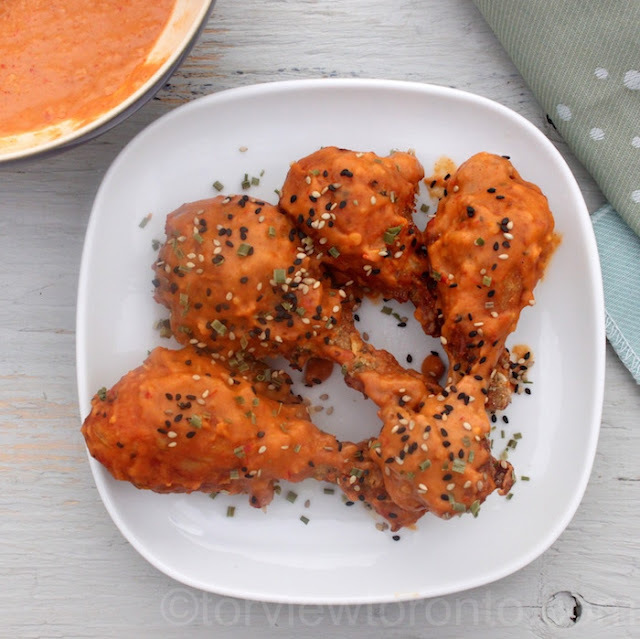 I am from Ontario and while I LOVE my chicken wings with my salt/pepper/paprika rub, my husband does not! So, given that, we only order in wings and I don't even eat them. BAH! I live in Ontario and depending on what sauce I use for my wings, I usually just have it on the side to dip into. 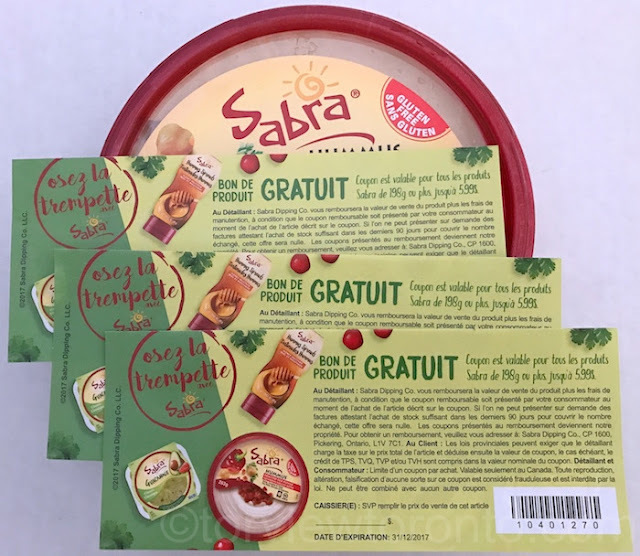 My daughter has just discovered she loves Hummus, so this prize pack would be awesome to win!! We are a family of 6 so we would all love to enjoy the prize pack!! I have actually never made chicken wings but think I would enjoy them with a honey garlic sauce on them. I live in Manitoba and I like using more then one sauce for my wings, so we can all try different kinds. We put them in separate bowls. I live in NB and make wings with garlic sauce. Im in BC. I just use a bbq sauce. I am in and I haven't tried any sauces with wings other than blue cheese dressing and ranch! I am in Alberta. I actually don't like chicken wings, but I tend to make really spicy ones for my husband. If I'm making them for the kids, I make a really simple salt & pepper wings. I melt some butter and season it generously. I coat the wings in the butter mixture and then bake at 325˚ for about 50 minutes. Newfoundland canada. I always just cover my wings with bbq sauce. Thanks! I'm from Ontario and like honey garlic sauce on my wings. I live in Ontario and I like my wing hot and spicy. I am in Newfoundland and I make a BBq sauce with lots of garlic. I live in Ontario and I like bbq sauce on my wings. I love the sound of your recipe though, thanks very much for the inspiration! I live in Hamilton, Ontario. I make lots of different sauces but most of them include garlic. I live in London Ontario, and love trying different ways to prepare sauces. Especially like the easy to prepare ones--the simpler the better! I live in Nova Scotia and I use a honey garlic sauce. I live in Ontario. I like my wings with garlic, medium, hot, regular, as long as they're aren't super hot, I'm game! We love Sabra products. I live in Fergus Ontario. We like our chicken wings with honey garlic sauce. BC. I like sweet and sour sauce on my wings! I am from NS. We do have do different sauces, a honey garlic and a barbeque sauce to accomodate different preferences. I live in NW Ontario. Your sauce looks delicious! I usually do a honey-mustard sauce on my wings. I live in Toronto and I make honey garlic with chilies. From Manitoba. I like my wings with my moms sweet and sour sauce recipe! I usually just use bbq sauce or a sweet and sour sauce, but this looks AMAZING. Never would have thought to use hummus. I live in BC. I only make hot wings. I make sure it's spicy but not too spicy and we have to have veggies and blue cheese/ranch dip on the side. I live in ON, and I've actually never made wings before, but I love dry wings! I am in BC. I usually mix my wings with garlic, honey and hot paprika. I live in BC and I have actually never made my own chicken wings - we usually just buy them pre-made. My favourite flavour is honey garlic. I'm in BC. I love just making the basic hot wings sauce for my wings, with some hot sauce, butter and paprika. I live in Saskatchewan. I like my wings hot and spicy. I'm in Ontario, and I like to bake them coated in a sauce of hot sauce, honey, and a few other secret ingredients. They stay nice and crispy without being fried! I live in Ontario. I just use whatever bbq sauce I have in the fridge for my wings. I live in Ontario. I usually make a bbq sauce for chicken wings. I live in Ontario. I don't do chicken wings often enough to have a favorite recipe. But the family is a HUGE fan of Sabra's greek olive hummus! I live in MB and don't have a favorite way! BC; honey & garlic wings! We usually but store bought but I will definitely try this recipe! I live in BC. I love spicy sauces, the hotter the better. I am in Ontario. I don't have a favourite way to prepare wings...just like them to be saucy. I live in Nova Scotia. I don't often make my own wings and sauce, but when we go out for wings, my favourite sauce is honey garlic. I live In Ontario. I love Honey Garlic but the hubby and daughters love extra hot. I live in Ontario. I love to prepare my wing sauce extra hot.